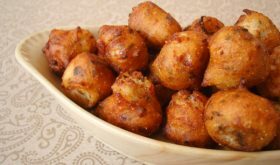 I have already blogged these crispy fritters, Punugulu with dosa batter.. Today, I am blogging a variation of the same. They are quick and easy to make crispy snacks, especially for a rainy day, with a cup of warm chai. Crispy on the outside, savory and tangy on the inside, these fritters are great snack on anytime of the day! Combine all the above ingredients except oil. Mix well. Leave aside for half an hour. Heat oil for deep frying. Once the oil gets hot, reduce flame to medium. Place a tablespoon for batter into the hot oil. 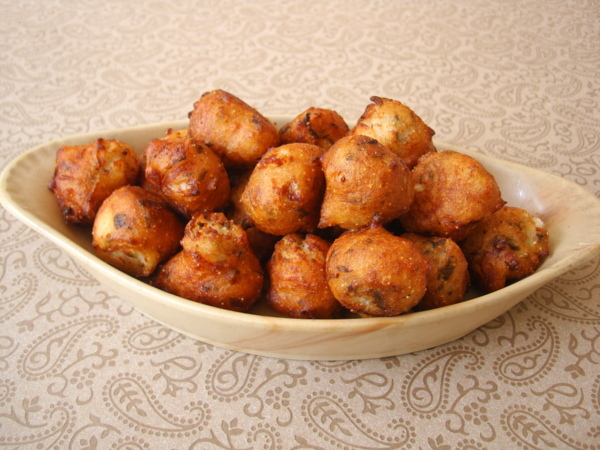 (You can use your hand instead of a spoon to drop small balls of the batter into the hot oil) Place 7-8 punugulu in the first batch. Do not crowd the vessel. Turn the punugulu as they change color and cook till golden brown. Remove onto absorbent paper. Serve with chutney of your choice. Add more rice flour if the batter is too thin. It should be a slightly thick batter. You can use fermented fresh dosa batter or 2-3 days old dosa batter which gives a nice sour flavor to the punugulu. By Sailu Published: July 21, 2012 Have left over dosa batter? 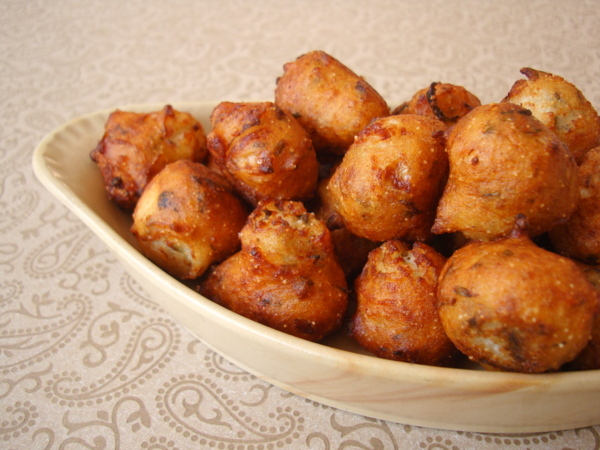 Make this perfect Monsoon snack - Punugulu. I have already blogged Punugulu recipe with dosa batter, today's its a variation. It’s a delicious way to use up left over dosa batter. Can survive with these bondas alone for months. Once you start eating them it is difficult to stop. Tried this dish and came out well. your recipes are very easy and inspires me to cook. Wow! It looks delicious and I’m ready to make this over coming weekend. That’s an awesome Recipe. Thanks for sharing with us. What is semolina called in Telugu? I am not sure what this ingredient is. In tamilnadu also people prepare it when the dosa batter became very sour. Came out very well.. Thank you for sharing the recipe sailu..
Can i make with rava idli batter? You can try. I have never tried it before. Ensure that there is not less water content. You can a few tbsps of rice flour or maida.